You were meant to cultivate and create. Humans are designed to build, craft, and compose; to bring order to chaos and cause things to flourish. The ability to create is baked in. To watch a kid enjoy life is to see them make stuff. Spend a day with a toddler and you’ll get a crash course in productivity. Perform a symphony of “ploonk!” throwing rocks in the creek. Produce dramatic improv with toy trucks and dolls. Paint the world with a crayon, first the paper, now the walls! Mom teaches restraint with a swat on the behind. She brings scrub brush and pail to the scribbled wall. She teaches us crayons are meant for the blank page. This makes the art better, easier for others to enjoy. Why do we live so differently as adults? Instead of running through life yelling, we mumble to ourselves. 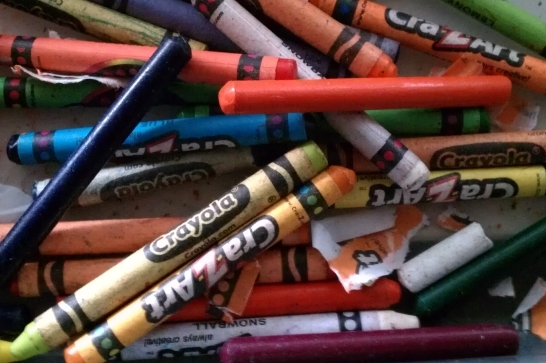 Though we’ve left behind crayons, we’re still given blank pages in our work. Why do we only make what we’re told? If our eyes still see wonder we don’t share what we see. Somewhere on the way to adulthood the message changed. Where Mom critiqued our performance, the world critiques our self. In a smirk, in a tone, the message is clear. It’s no swat on the behind, this pierces us deeply. A little part of us dies. Why bother sharing if this is the response? We shuffle along carefully, keeping mostly to ourselves. But joy isn’t full until it is shared, and if life is meant to be enjoyed, joylessness is also a kind of death. Dare create things for others and you might die trying. Abstain from joy and you will never really live. There are some people who have found a way to live, even in the face of death. They choose to see their work as a series of blank pages and they fill them with color, helping us see the world differently than we did before. Recently I was given a review copy of the book Untitled: Thoughts on the creative process by Blaine Hogan. His book is divided into four movements. The movements progress through how to do this sort of work, the source of the work, the resistance that is encountered when the work is being done, to an assurance that the work is worth the effort. Although the book is written primarily for writers, actors, musicians, and artists, the principles apply for anyone wanting to help others see something good in the world. Blaine shares a simple method for doing the work: start, get help, let go of expectations, simplify, persevere, and share your struggles. It isn’t a secret formula, it’s just plain old, unsexy work. And yet, it is work that can be done, and by doing the work this way, we might just find ourselves a kid once more.